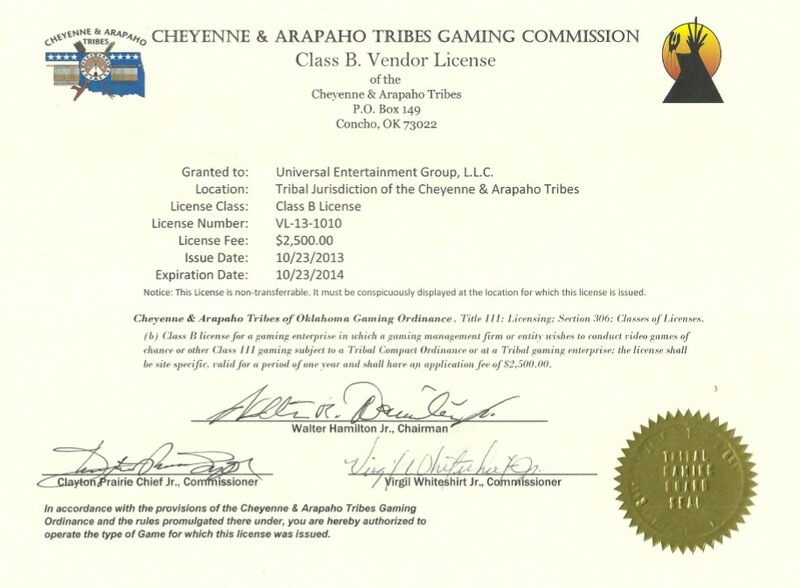 Here’s Part 2 of our look into how the Cheyenne and Arapaho Tribes of Oklahoma continue to seek some form of restitution for the $9.45 million the tribe sunk into its online-gaming venture with Universal Entertainment Group (UEG) in 2012 and 2013. For Part 1, which covers the most recent developments, click here. Among the major questions still publicly unanswered in the Cheyenne and Arapaho Tribes’ PokerTribes.com fiasco are exactly how the Oklahoma tribal nation allowed itself to sink $9.45 million of its own casino-gaming revenue into such a highly questionable project, in such a short period of time, and under questionable terms of authorization under the tribe’s constitution. All those issues and more have been raised in the many formal complaints brought by the tribe, including requests for assistance from the US’s Bureau of Indian Affairs (BIA) and the Federal Bureau of Investigation (FBI) since 2014. Those complaints allege that several prominent officials in the administration of former C&A Governor Janice Prairie Chief-Boswell (Boswell) committed embezzlement and/or broke tribal law in executing the deal with UEG. Those federal investigations have trudged along at a snail’s pace for years, while the C&A nation has also taken some steps on its own. Last September, the tribe filed its own complaint — in its own tribal court — against a dozen defendants from UEG, Boswell and other former officials, and some third-party intermediaries. Among those named in the lawsuit were UEG execs Isaias Almiras, Tatiana Vlasenko, and Fereidoun “Fred” Khalilian, former C&A casino managers Thomas Fox and Barbara Paukei, attorney Richard Grellner, who helped negotiate the Pokertribes.com deal, former C&A Governor Boswell, and the former head of gaming operations for the Cheyenne and Arapaho, Brian Foster, who was the central conduit between the tribe and UEG for the millions of dollars sent that firm’s way. Whether the filing of the case by then-Governor Eddie Hamilton was a political re-election ploy, as claimed by Khalilian and Foster, is unclear. (Hamilton lost his reelection bid.) However, that filing allowed additional federal agencies such as the National Indian Gaming Commission to look into the whole sad PokerTribes saga, adding to the list of ongoing investigations. “Eddie Hamilton is a sore loser — that’s what he is,” Khalilian told NewsOK’s Brianna Bailey last year. “The Iowa Tribe has gone further than the Cheyenne and Arapaho ever did and Hamilton has egg on his face now.” That was, of course, before the Iowa Tribe dumped Khalilian and UEG, but not without the loss of another $10 million by that tribe as well. How exactly did the Cheyenne and Arapaho Tribes somehow ship over $9.4 million UEG’s way? Before digging into the why, let’s start here: It was done quickly, according to contracts that were turned over by UEG to the Department of Justice in 2014 as part of one of the ongoing investigations. The deal between the C&A’s and UEG was a two-parter, consisting of the sale of the domains PokerTribes.com and BingoTribes.com, plus the supporting gaming software. The contract for PokerTribes.com was signed on July 23, 2012, with a purchase price of $5.6 million. 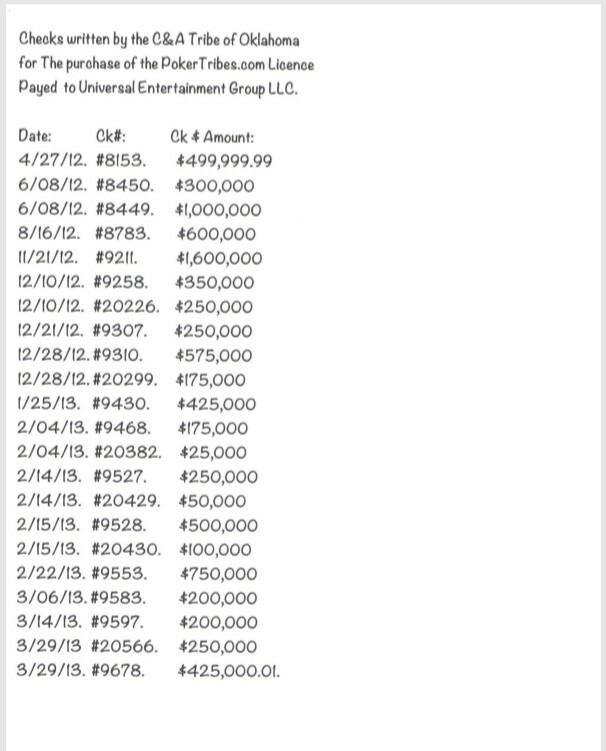 The contract called for four large installments to be paid over the next several months, concluding on November 15, 2012. On October 15, 2012, just 12 weeks later, the Cheyenne and Arapaho Tribes agreed to cough up another $3.85 million for the rights to BingoTribes.com, with he remainder also due by November 15, 2012. Yes, that’s literally the ledger-of-payments page sent from UEG to the DOJ, which speaks to the level of professional quality involved. Still, as we teased in Part 1, it could have been even worse for the Cheyenne and Arapahos, had the site ever come to fruition. Both purchase agreements called for the tribe to retain 71% of “gross win revenues” from all gaming operations, including any third-party licenses sold by the tribe. The other 29% was to go to UEG under the terms on an ongoing “Consulting Agreement”. Given that the software never came close to going live — the 2017 lawsuit alleges it was a platform Khalilian obtained years earlier from a former business partner in Georgia — that 29% was surely pure air. Yet it helps to illustrate the utterly ludicrous nature of the entire scheme. At what point does the whole thing shift over from gross mismanagement and negligence into fraud and embezzlement? That’s another of the open questions. The whole thing involving former Governor Boswell and her short-lived administration has more layers of intrigue: Boswell’s legitimacy as the tribe’s ruling official was itself in dispute as the entire PokerTribes.com deal played out. Boswell was elected to the office in late 2009 and quickly became unpopular with other C&A elements, to the point that a recall election was held and a new Governor (Leslie Wandree-Harjo) seemingly elected, though those results were deemed invalid in later court actions, leaving Boswell temporarily in power. The Cheyenne and Arapaho Tribes wasn’t even recognized formally as a federal tribal nation until 2006, and if you think the tribe’s brief “recognized” history has been tumultuous, you’d be right. It’s been a see-saw for more than a decade between multiple factions, with at least one group (including Boswell) associated with the Cheyenne and Arapaho Tribes’ gaming operations, and another for years alleging corruption and mismanagement. Pokertribes.com, the alleged poker website and online gaming venture conceived and executed in secret, was later introduced to the media as a sure bet after documents were released to a vast majority of tribal members through email and social media about the transaction. The online gaming site was then publicized as a big win for the Tribes, Oklahoma and the rest of the country. Considering the shady circumstances of the games history and origin, it is still not clear if Pokertribes.com was what it was publicized as being, or a stunt created to cover the funneling of 9.6 million from the tribes casinos into the hands of individuals who, at the time were having to answer charges of unfair business practices by the Federal Trade Commission. The contracts between UEG and the Cheyenne and Arapaho Tribes appear quite legal on their surface, despite the ridiculous overpricing and terms. UEG itself, of course, was a fiscal black box, with $4.2 million of the C& money quickly going to resolve the back settlement UEG’s Khalilian still owed from that 2010 telemarketing-fraud case. Flyingman’s claims about a lack of due diligence continue to ring true, regardless of some of his other claims, and those same lack-of-due-diligence claims could also be made regarding UEG’s later deal with the Iowa Tribe of Oklahoma, which eventually became the Grey Snow Poker project. Flyingman also cited several suspect contracts, payments, and business relationships in his blasting of the PokerTribes.com affair. Whether this convoluted mess every gets fully sorted out remains unknown. Yet as pieces of the story emerge, the overall picture remains the same, of a nonsense project and a big-money con job, with the Cheyenne and Arapaho Tribes gaming funds the fleeced target.